We chose the same holiday spot this year as last, a nice town called L’Escala on the Costa Brava about a 90 minute drive from Barcelona and only 45 minutes from France. It was a cracking break and as with last year one of the highlights for me was being able to try a few smokes I had not had before, this applied to all but the Sancho Panza Non Plus below. 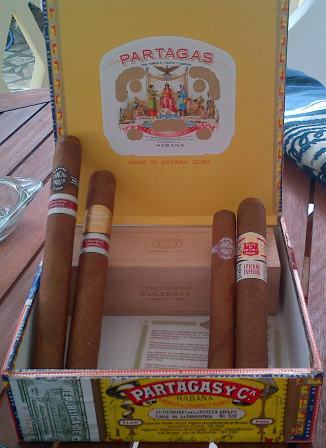 Spain is a big market for Cuban Cigars and the tobacconist/cigar shop in the town is well run and has a decent range. So other than starting the holiday with a light cold and sore throat it was full steam ahead. I didn’t make many notes so made sure of giving a score out of 20 as a guide to what I thought. First up was Rafael Gonzales Petit Coronas (16.25, second from the left in the picture below) this is a marque that gets very little focus or promotion but to my mind supplies elegant cigars that are not to be ignored, they are not blockbusters but then as with wine you sometimes want something refreshing and non taxing I really enjoyed this on a stroll into town on one of our first nights. The next cigar followed a lunch up the coast in Cadeques (see picture), a beautiful fishing town that is well worth a visit it was a Ramon Allones Small Club Corona (16). Rather strangely I own a box of these despite never having had one, but then I often sell wine to people who haven’t had it so I suppose it is not that strange. I bought the box because a lot of people who I know like Partagas shorts as I do and they have often said these are of similar quality. I would have to agree, a punchy rich but not overly spicy number with a good bit of leather too, very enjoyable. I have been looking forward to trying a Romeo & Juliette Cazadores (18, left of the picture) for sometime. Cazadores means “hunter” in Spanish and this smoke has an uncompromising reputation. A box of them comes wrapped in foil and they do not have a band on them. I really enjoyed this smoke, it had a rugged richness and developed well with intensity building. After a big BBQ dinner it was superb, not harsh but certainly it lived up to its reputation. I will buy a box and give them a few years. On another note I absolutely love the size, a Lonsdale, it is perfect in the hand and gives enough smoke without being too thin, the fact that it is not box pressed is also a good thing to my mind. 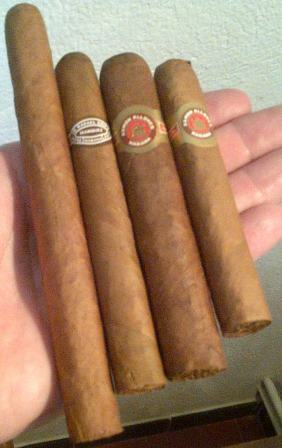 Next up was the Ramon Allones Specially Selected (17, second from the right) this is a cigar I know well and this was a perfect, if young example of this smoke, rich but not heavy with the stewed fruit and Christmas cake character that you expect from Ramon Allones. The construction was a little loose so this was not to be smoked too fast. A good smoke nonetheless and it remains one of the leading Robustos and certainly amongst the best value Cubans out there, the box I have will see at least 2-3 years of age before being opened. A Sancho Panza Non Plus (15, top photo second from left) the following evening was a trip down memory lane for me. When I first went to Davidoff in St.James about 15 years ago I asked what I should try in order to get a good feel for the world of Cuban Cigars I was suggested this very stick. It is light to medium in body, balanced but not taxing. Enjoyably simple if you like, a great morning cigar. The Sancho Panza brand is treated (I would say neglected) by Habanos SA in general, a little like Rafael Gonzalez it has had a reduction made to its range. 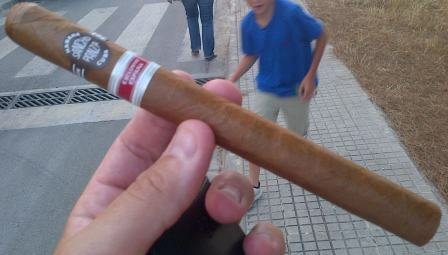 There is though one market in which the brand is big and that is Spain, hence the production/selection of a limited release for Spain in 2010 of the Sancho Panza Quijote (17.25, below). This is a Double Corona size and as a result a good 80-90minutes worth of smoking. It had real balance about it, was medium in weight almost the entire way through. It will age well I feel, there is a character more akin to tea and leather than coffee and spice which is a profile I like. This is a good cigar in a size I don’t smoke often, did it make the earth move? No, but it is good and I would smoke another just probably not buy a box, although a box of 10 is tempting. From a large cigar to the other end of the scale – Le Hoyo du Depute (16.5) from Hoyo de Monterrey rounded off the weeks smoking. What a little cracker it was, this could be a new favourite smaller smoke, very Cuban, a little bit of everything and in a lovely thin ring gauge (38×110). It was everything that is nice about a smoke in a very tidy little package. You will notice from the photos that there were even a few smokes I didn’t get to have whilst away so these I will have soon and write up then!